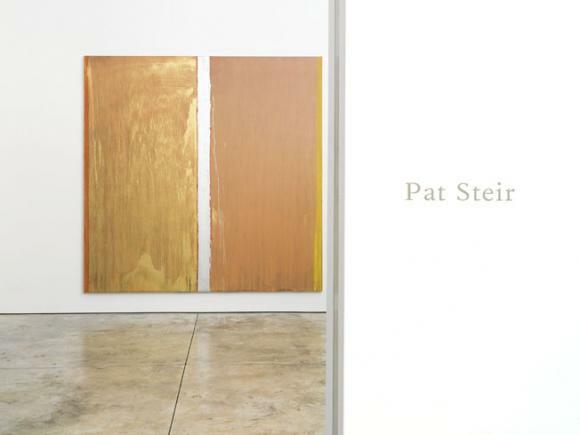 Cheim & Read is pleased to announce an exhibition of recent work by New York painter Pat Steir. The show is accompanied by a full-color catalogue with an essay by Raphael Rubinstein. Pat Steir is known for paintings in which paint is dripped, splashed and poured on canvas, resulting in fields of lush, saturated color. Born in Newark, New Jersey, in 1940, Steir began showing in the early 1960s, soon after graduating from Pratt Institute in 1962. Loosely aligned with Conceptual Art and Minimalism, her career began amid a hotbed of artistic debate concerning not only the aesthetics and production of art, but also the role of the artist. Steir’s early paintings questioned modes of both abstraction and representation, and led to works that attempted to eradicate any sense of narration or figuration. In more recent work, she, as the artist (her gesture, her intention), has also been eliminated. The act of painting is reduced to the materiality of paint itself. Compared to Abstract Expressionism, in which the artist’s mark, and thus his myth, is celebrated, Steir’s canvases express a Zen-like emptiness; she has made all attempts to extinguish the ego. Steir’s work conveys a sense of vast, infinite space while simultaneously bringing attention to the pigment-strewn flatness of the painted surface. This simultaneity is at the core of her practice, and is a reflection of her long-standing interest in ancient Chinese philosophy and artistic traditions. Though painted on one support, Steir’s compositions are often bisected by a centerline, requiring the viewer to oscillate between both halves of the painting. As Rubinstein remarks, this has the effect of opening one side as it closes the other, echoing concepts of Chinese painting in which binary pairs, like “opening/closure,” “empty/full,” and “rising/falling,” are integral to the work’s realization. The two sides of Steir’s paintings interact at their centers, sometimes merging together and sometimes separating: the centerline both divides and eternally connects. For Steir – who has said, “all my work is a search and an experiment” – harmony relies on the duality of opposites, and the unpredictability and spontaneity in their making.